It really feels a bit like some sort of Jurassic Park ecosystem - with tons and tons of animals living in the flat floor of a giant crater 18km across encircled by 600m high walls. Just amazing. And even a (very distant) black rhino! Lush, beautiful and teeming with life. There were many animals that we spotted here that we didn't see in Tanagire or the Serengeti as they are so exposed in the crater. The highlight this morning was seeing the hyenas, vultures and jackals scavenge around the remains of a carcass. An amazing end to a brilliant few days! Lions Lions Lions!!! And a Leopard. The Serengeti is the real thing, I suppose. Just awesome. Sleeping in a tent in the middle of the veldt with big animals wandering in and around the flimsy tents is pretty cool. Nothing can beat driving around at 6.30 am as the sun is rising in the Serengeti. It was one of the best experiences of my life seeing so many lions and cubs. The highlights were seeing a group of lionesses with nine or ten cubs walk straight next to the vehicle. They really are amazing animals. Baobobs. And more Baobobs. They are such awesome trees! Quite sad to see the very ill baby elephant, but the mother made it quite clear that she'd rather we leave them in peace. We left. The first day of our four day camping safari and it started on a high. We saw an unbelievable amount of elephants in Tanagire and the concentration of wildlife was absolutely mind blowing. The tsetse flies were nasty though! I had dreamed of going to Zanzibar ever since I first encountered a book written by my old lecturer in post-colonial studies at uni. It conjured up the picture of an exotic place: a beautiful spice island in the Indian Ocean with wonderful architecture and furniture. 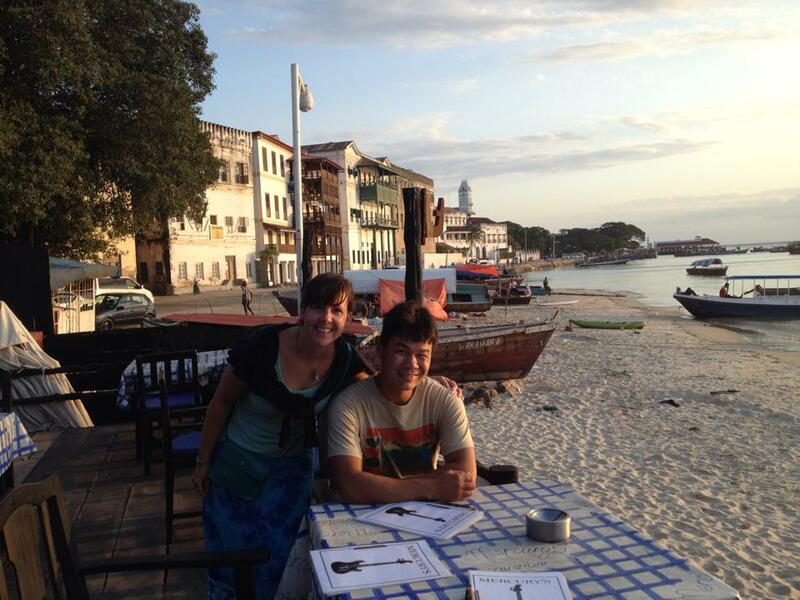 We spent a while hanging out in Stone Town. Once hardened to the persistent touts greetings of 'Jambo' and 'rifiki' (you are not my friend!!) and used to the fact that it was Ramadan and not many places were open for food during the day, we were able to relax a little. Having ambled around a few streets we found a lovely new reasonably priced hotel right in the centre of Stonetown with very few customers, so we had a rooftop mini pool all to ourselves and our room had super reliable wifi and even a hammam style shower. Sweet. 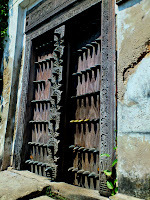 The most incredible thing in Stone Town are the doors- huge intricately carved wooden doors with massive metal studs. The sunsets were awesome too and we enjoyed going to the night food market to get a bite, hanging out with the large community of cats and enjoying a cup ginger tea. I also tried lobster for the first time. After the big bad city we caught a dalla dalla (public bus) to the East Coast to go and stay with a friend's friend at their pizza restaurant on the beach. Although we were only there for three days it was the best place to unwind from the stresses of job searching and it felt like we were there for ages. The particular spot on the beach was amazing people watching and we had the most delicious avocado coconut cream and chocolate milkshakes. Heaven. The final day was spent at The Rock- one of those places that I had seen popping up on internet feeds about top places to drink in around the world. It is a tiny coral islet just a few metres from the shore with a restaurant perched on top. We ended up spending over five hours there as the experience was so fantastic. 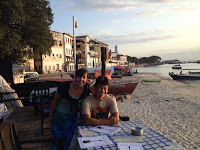 Great to quite randomly meet up with a friend from Australia in Stonetown, and take it easy on the east coast. Snorkeling out towards the reef from a makeshift outrigger sailboat was also awesome. Check out the shark teeth painted on the tips of the hull and the sail made from stitched-together sacks. Nice. Overall, the visit was great - especially seeing as my pervading memory of my last time in Zanzibar 15 years ago was just lying on my back on a steamy flea-ridden foam mattress in a dirty 5-dollar room staring upwards at a slowly turning ceiling fan - like in Apocalypse Now. I could only remember the colour grey, and the pounding headaches. I had malaria at the time, and it was a bummer. In fact, there's bright colours, beautiful sunshine, warm sea, puffy white sand. The place still has some pretty serious issues - especially to do with security - but on the whole it's been great to visit again and see it in a new light. Good stuff.